This is the season of Bengal special "Pithe Puli". In Makar Sankranti Bengali are busy in making sweets. The sweets are cooked with Nolen Gur Or Jaggery, instead of sugar. 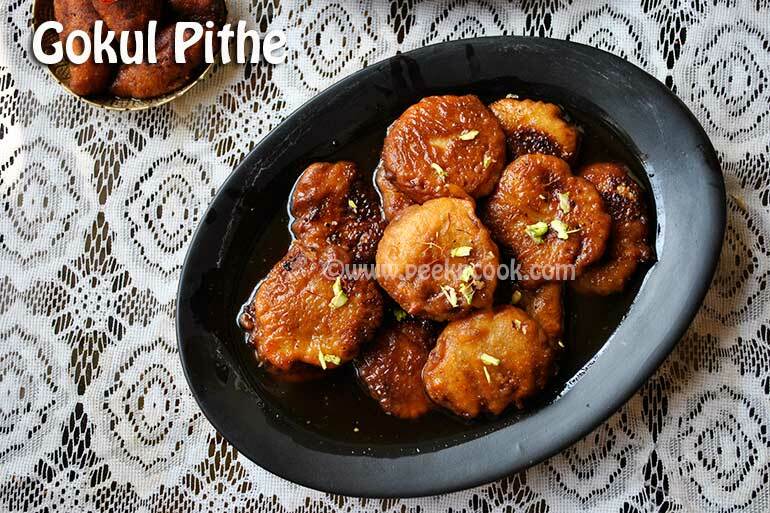 Many different types of sweets, which are called Pithe are made during this season, like "Puli Payesh, Patishaptas, Bhaja Puli, Aske Pithe, Gokul Pithe" etc. This is a little lengthy process, but not very difficult. But all the hard work worth after having the sweet. It tastes heavenly. But do not keep them for long time, the Pithes should be consumed with the day of making. No more discussion, here is the recipe of Gokul Pithe... Today I'm going to share the recipe of "Gokul Pithe", which is made with scraped coconut & khoya Or milk solid. In this recipe, at first stuffing is made with scraped coconut, khoya & jaggery, then shaped them into cakes, dipped into rice flour, Maida, semolina batter, deep fried and soaked into jaggery syrup. Today I'm going to share the recipe of "Gokul Pithe", which is made with scraped coconut & khoya Or milk solid. Take a non-stick pan, add scraped coconut, khoya, jaggery, sugar and crushed cardamom and put on low flame. Keep stirring, make a sticky stuffing. When everything will be together, the stuffing is ready. Now turn off the heat, keep the pan aside and let the stuffing cool down completely. In the meantime make the batter and syrup. First take a sauce pan, put jaggery, sugar, water, saffron & cardamom pods, put on medium flame. Let the syrup boil for 5 minutes on medium heat, turn off the heat. Now take a medium size bowl, add rice flour, maida, suji & milk to make pakora/fritters batter. Now take little amount of the coconut, khoya mixture, make small balls with your plum. Then flatten it by pressing with the other palm to make it look like patty. Put the coconut khoya mixture patties on a wax paper. Heat enough oil/ghee in a deep frying pan. Now grease your palm with some oil, take each patty, dip into the flour batter and drop into the hot oil. Do not add too much pithes at time, not more than 2-3 at a time. Fry them on low heat till golden brown, take them out of the pan and put into the warm syrup for 1-2 minutes. After 1-2 minutes, take them out of the syrup and put on a flat serving plate. You may serve them warm or at room temperature. Enjoy your 'Gokul Pithe'.